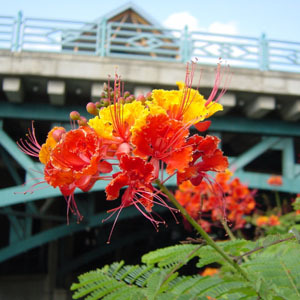 Pride of Barbados is a fast growing shrub or small tree native to the West Indies with red to orange flowers with long showy red stamens. The flowers are arranged on racemes and can have as many as 40 flowers per flower stalk. The foliage is fine textured, similar to Mimosa spp. and is light green in color. Caesalpinia pulcherrima can freeze back in the winter but it will quickly sprout back in the spring. Pride of Barbados is heat and drought tolerant and can grow to 6′ by 6′. This plant is great for desert look with color. Attracts butterflies!